The University of Delaware has joined a network of institutions in the Northeast aimed at helping people live longer, healthier lives. DRIVEN, a new accelerator hub for medical entrepreneurship funded by $3.5 million from the National Institutes of Health (NIH), aims to help people live longer, healthier lives by increasing the number of quality medical startups in the Northeast, decreasing their time to market, and increasing their probability of success. The DRIVEN Accelerator Hub also includes Celdara Medical, University of Vermont, Brown University, Dartmouth College, Maine Medical Center, Mount Desert Island Biological Laboratory, University of New Hampshire, University of Rhode Island and Simbex, a medical devices design company. It is one of four accelerator hubs across the country funded by the National Institute of General Medical Sciences (part of NIH). Each hub is designed to provide entrepreneurial educational opportunities and experiences for innovators, and to develop and implement a structural plan to support medical entrepreneurship. 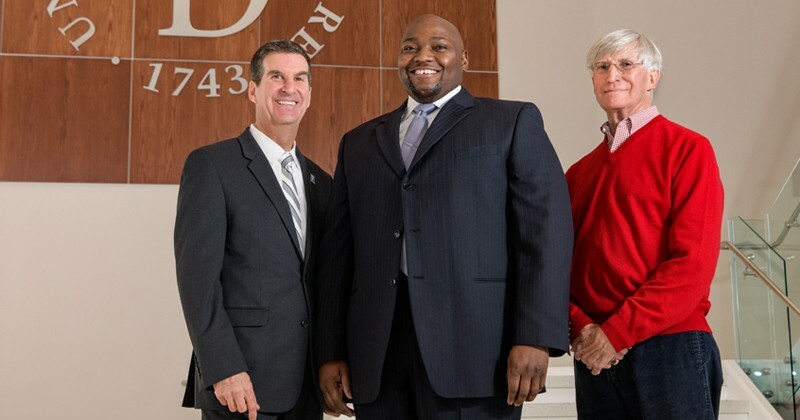 The UD component of DRIVEN is being led by principal investigator Julius Korley, director of entrepreneurship and strategic partnerships for the College of Engineering and CEO of Affinity Therapeutics; Steven Stanhope, principal investigator of Delaware Idea Network of Biomedical Research Excellence (INBRE) and associate vice president for research; and Michael Bowman, associate director of the Office of Economic Innovation and Partnerships(OEIP). “This Regional Accelerator Hub grant will focus on turning scientific discoveries into jobs and new small businesses in Delaware and products that reduce the cost and improve the quality of healthcare,” said Stanhope. The UD component of DRIVEN is being led by, from left to right: Steven Stanhope, principal investigator of Delaware INBRE and associate vice president for research; Julius Korley, principal investigator of UD’s component of DRIVEN and director of entrepreneurship and strategic partnerships for the College of Engineering and CEO of Affinity Therapeutics; and Michael Bowman, associate director of the Office of Economic Innovation and Partnerships. The hub is designed to help bring exciting new opportunities to faculty and students. One of the team’s first projects is a survey to assess the medical entrepreneurial ecosystem and identify pain points for medical entrepreneurs in the First State. This information will help the team create a centralized online hub for entrepreneurs, featuring information on resources from classes to funding opportunities to pitch competitions and more. “We’re trying to create an ecosystem that can easily be navigated by people who want to commercialize biomedical technology in Delaware,” said Korley. The path to commercialization is especially complex for entrepreneurs in the medical sector, since pharmaceuticals, medical devices and other inventions must go through not only the patent process, but also the FDA approval process and additional special steps before they hit the market. When Korley started his first biomedical business, he was fortunate enough to have a mentor with years of experience in the industry. Not everyone has those firsthand connections, but resources such as Delaware’s Small Business Development Center, a unit of OEIP, can help, and the DRIVEN teams aims to connect innovators with the right resources for them. After gathering information and establishing the online resource map for entrepreneurs, DRIVEN will develop new resources to fill identified gaps in the entrepreneurial ecosystem. Although it’s too early to say what those offerings will be, they could include for example resources such as short courses or access to business expertise in the biomedical space. Throughout the process, Korley, Stanhope and Bowman will network with leaders at the other institutions, universities and medical schools participating in the DRIVEN Accelerator Hub. “The potential for collaboration is great,” said Korley. NIH’s Institutional Development Award (IDeA) program builds research capacities in states, including Delaware, that historically have had low levels of NIH funding. 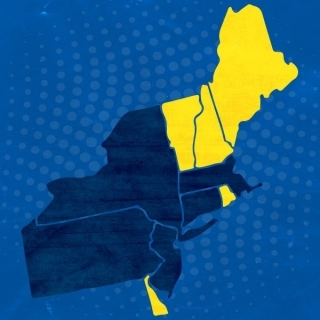 Maine, New Hampshire, Vermont and Rhode Island are the other IDeA states in the region, and these states have a storied history of collaboration, said Stanhope. The yellow states on this map are home to institutions participating in the DRIVEN Accelerator Hub. UD has been a frequent awardee of competitive grant programs from NIH and the National Science Foundation (NSF) for smaller states, and UD is recognized as a regional leader, said Bowman. Economic development is one anticipated outcome of awardees. “The DRIVEN Accelerate Hub is one example, spurred by NIH, to amplify an ecosystem of resources and best practices to help academics and entrepreneurs succeed,” Bowman said. The DRIVEN Accelerator Hub is supported by NIH Grant 1UT2GM130176-01.